KAHULUI – The Hawaii Department of Transportation (HDOT), Harbors Division held a blessing ceremony Wednesday, March 27, 2019, to celebrate the completion of the Harbors Maui District Office Relocation project. This work is part of the Harbors Division’s facility improvement projects planned throughout the commercial harbor system that will support the state’s economic growth and maritime industries. In 2012, HDOT Harbors Maui District conducted an assessment study to best utilize the land at Kahului Harbor to meet current operational needs as well as the future demands for cargo processing areas. The study identified opportunities that would improve the use of land and decrease congestion of geographical constraints by relocating the Harbors Maui District Office to the Old Kahului Railroad Building A on Kaahumanu Avenue and allow the adjacent Buildings B and C for to be used by others. Renovation work on the Harbors Maui District Office preserves the historic architectural features of the former Kahului Railroad Building while upgrading the plumbing, air conditioning, fire sprinkler, electrical, communications systems, improve architectural items, cabinets, and landscaping. This was a state funded project with an estimated cost of $7.5 million. HDOT is looking forward to other improvements at Kahului Harbor that will further provide facilities that meet the diverse needs and safety of cargo operations and commercial activities and better serve the community. Kahu Kalani Wong, HDOT Harbors Maui District Manager Duane Kim, Gov. 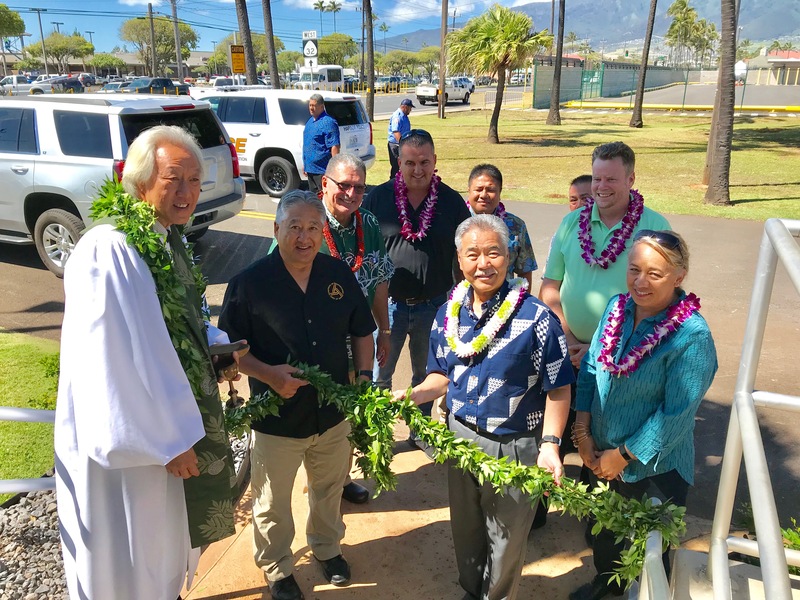 David Ige, Rep. Lynn DeCoite, Mayor Mike Victorino, Dan Blackburn of F&H Construction, HDOT Director Jade Butay, HDOT Deputy Director for Harbors Derek Chow, and Rep. Angus McKelvey untie the maile lei fronting the new Maui Harbor District Office. HDOT Harbors Maui District Manager Duane Kim, Gov. 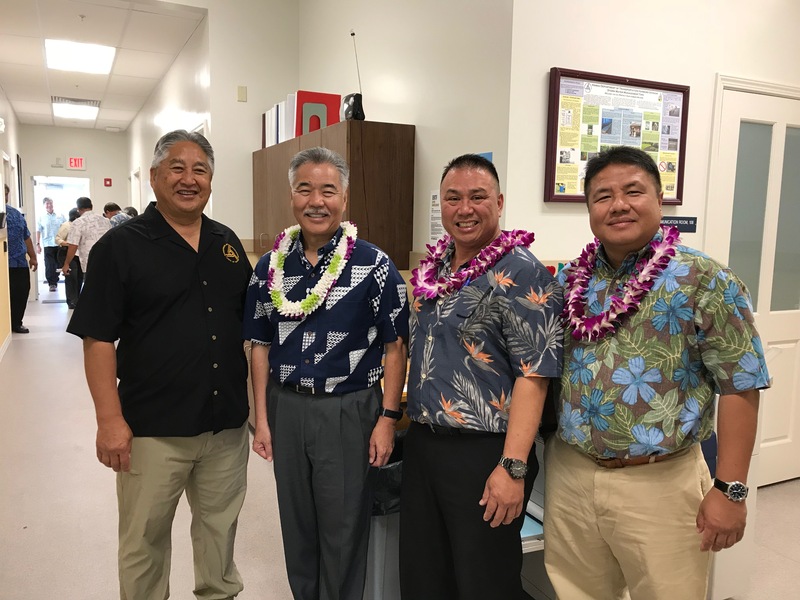 David Ige, HDOT Deputy Director for Harbors Derek Chow, and HDOT Director Jade Butay pictured within the relocated district office. Gov. 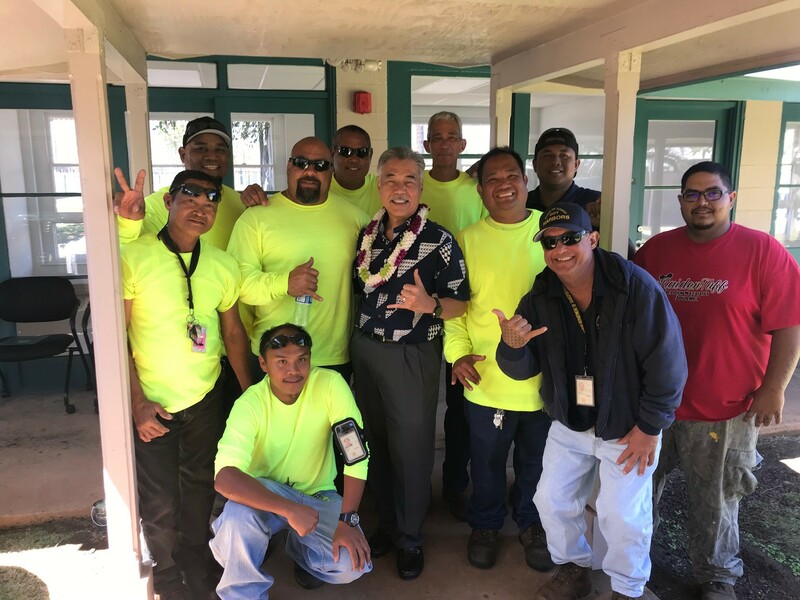 David Ige (center) joins Maui District Harbors staff in a shaka.